An armed gang pulled knives on pizza delivery drivers in Kettering before robbing them. 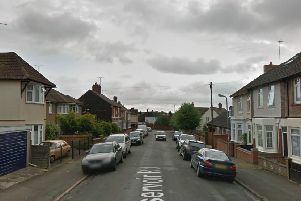 Police say they believe the two incidents on the Grange estate at the weekend are connected. The first terrifying incident took place in Judith Road at about 11.30pm on Saturday, November 17. The delivery driver was on foot looking for an address when four men with face coverings appeared from a side alley and all produced knives. They threatened the driver to hand over their phone, cash and the pizzas, before running back up the alley. The driver was unharmed in the incident. The second incident took place the following evening (Sunday) at about 8.30pm in nearby Charlotte Place. The victim was delivering pizzas and walked across a green area to locate the address. A man shouted at her and told her to give him the pizzas. She saw a small knife being held in front of him to threw the pizzas near him. Another man then demanded money and her mobile phone. She threw them on the floor and ran back to her vehicle. The men took the items and ran off. A police spokesman said they had made no arrests so far but urged anyone with information about either of the incidents to contact them on 101. Detective Constable Mark Webb said: ”These were very worrying attacks and we are exploring the possibility that they are related crimes. Det Con Webb’s safety advice includes: be alert for suspicious people loitering around the areas of your deliveries, be alert to vehicles which may be following you while you are on your route, write down a description of the vehicle and the licence number as well as a description of the occupants, don’t carry more money than absolutely necessary, keep the doors to the vehicle locked at all times, keep the vehicle keys separate from the rest of your keys and be careful not to park in isolated areas. Police advice if you are the victim of a robbery is to remain calm and follow the instructions of the suspect, to try to focus on getting a description of the suspect and any details on vehicles involved such as a plate number or direction of travel and to get to a place of safety and call 999.